More and more websites use gradients in one way or another. Some websites use them for navigation components, while others use them in elements like buttons, or with images to create some nice effects. All browsers have had support for basic CSS linear and radial gradients for a long time now. The CSS Gradients: A Syntax Crash Course article on SitePoint gives you a quick summary of the syntax required to create linear and radial gradients, as well as how to use repeating gradients to create some basic patterns, which is great if you care about web performance and try to avoid using images whenever possible. After linear and radial gradients, browsers are now slowly starting to support conic gradients, which were first championed by Lea Verou. In this article, you will learn about the syntax, uses, and browser support for simple conic gradients and repeating conic gradients. Conic and radial gradients are similar in the sense that both of them start from a specified or default point as the center of the circle used to draw them. 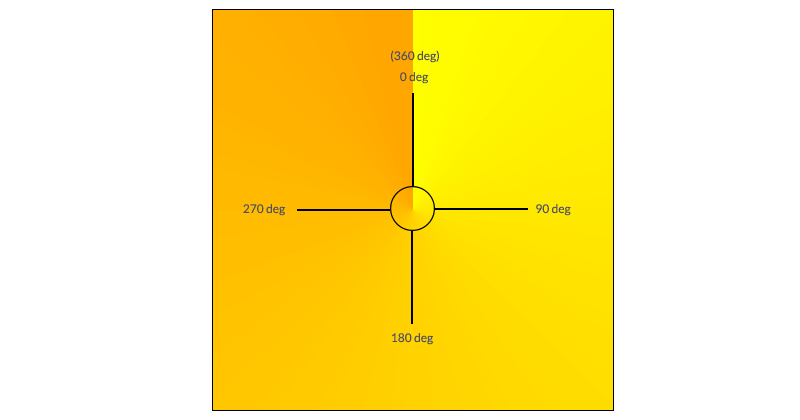 The difference between the two is that, in the case of radial gradients the color-stops are placed along the radial line, while in the case of conic gradients the color stops are placed along the circumference of the circle. The position of color-stops for a conic gradient can be specified either in terms of percentage or in terms of degrees. A value of 0% or 0deg refers to the top of the conic gradient. The values keep increasing gradually as you move clockwise. A value of 360deg is equivalent to 0deg. Any color whose color-stop value is greater than 100% or 360deg won’t be drawn on the conic gradient but it will still affect its color distribution. The following image shows a conic gradient that starts with a yellow color and ends with orange. It is hard not to notice the sharp transition that separates the orange at 360deg from the yellow at 0deg. Remember that conic gradients always produce this transition whenever the starting and ending colors of the conic gradient are very different. One way to avoid it is setting the starting and ending color to the same value. See the Pen Creating a Conic Gradient by SitePoint (@SitePoint) on CodePen. Not all browsers support conic gradients at present, so I will be including a reference image with each example to show what the final result is supposed to look like. You can use conic gradients to create different kinds of color wheels. As an example, the following demo uses the colors of a rainbow in the conic gradient to create a rainbow wheel. Notice how I have set both the start and end color of the conic gradient to violet to avoid sudden transitions. See the Pen Creating a Conic Gradient – Rainbow Wheel by SitePoint (@SitePoint) on CodePen. Another benefit of conic gradients is the ability to create pie charts with ease. The process for creating pie charts is actually very simple. All you have to do is provide some hard color-stop values for different colors. Each color of the gradient can be given a start and end angle. When the value of the start angle for the next color is less than or equal to the value of the end angle for the current color, they will display in a very sharp, instantaneous color change resulting in the formation of distinct sectors. There are two ways for specifying these color-stop values. The first one is to always set the start angle for each color to zero. The second method is to set the start angle of the next color equal to the end angle of the previous color. What you finally decide to do is a matter of preference. See the Pen Creating a Conic Gradient – Pie Charts by SitePoint (@SitePoint) on CodePen. Creating a donut chart is just a matter of applying an additional radial gradient on your element with hard color-stops. The inner color of the radial gradient can be set to white and the outer portion can be made transparent. See the Pen Creating a Conic Gradient – Donut Charts by SitePoint (@SitePoint) on CodePen. A repeating conic gradient accepts all the same values as a regular conic gradient. The only difference is that this time it will keep repeating itself until the whole 360 degrees have been covered. You can use this repetition to create some common image patterns that previously required the use of images. You can easily modify the pie charts to create starburst-like backgrounds. All you have to do is use repeating-conic-gradients and reduce the width of each color segment by a suitable amount. Similarly, you can create a checkerboard pattern with ease by setting the width of each sector to be 25% and setting the background-size. See the Pen Repeating Conic Gradient – Checkerboards by SitePoint (@SitePoint) on CodePen. You can create many more patterns by varying the size of different sectors as well as changing the from angle for the gradients. At the time of writing this article, conic gradients are supported in Chrome 59+ and Opera 46+ behind the “Experimental Web Platform Features” flag. No other browser supports this new standard, either by default or behind some flag. This means that you will have to wait a little before there is enough browsers support. However, you can start using CSS conic gradients today with the help of an excellent CSS conic-gradient() polyfill created by Lea Verou. There is also a PostCSS Conic Gradient plugin that automatically adds a conic gradient fallback to your CSS files. 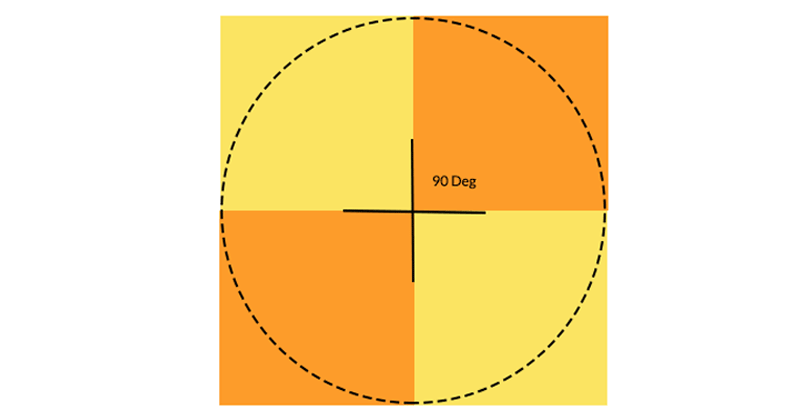 This tutorial showed you how to create pie and donut charts using conic gradients. After that, you learned how to create different background patterns using just CSS with the help of repeating conic gradients. Once the browser support is good enough, you will no longer have to rely on large libraries or images to accomplish these tasks. Lea Verou’s initial draft specification, which dates back to 2011. Can you suggest any unique uses for conic gradients on the web? Let us know in the comments.